By Jakub Janus - PhD. What is the net profit margin (net income margin)? How to calculate net profit margin? Is there an optimal net profit margin ratio? 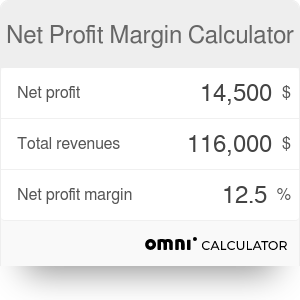 The net profit margin calculator allows you to work out a simple and intuitive measure of a company's profitability in relation to its total revenues. It's a straightforward way to determine how large is the profit generated by a single dollar of sales. Business owners, investors, and shareholders generally prefer a higher net profit margin ratio (also called "net income margin"), as it indicates the overall financial health of a company, and informs you if its business model is effective and sustainable. What exactly is the net profit margin? How to calculate net profit margin with your data? What's the best value for the net profit margin ratio? The net profit margin is one of the basic profitability ratios you can find in financial analytics. It's often used to complement well-known efficiency measures that rely on asset or equity values. Unlike these indexes, the net profit margin compares net income to total revenue. This indicator is based on the idea that each sale a company makes translates into revenue. Revenues, in turn, are converted into income. The net profit margin formula may approximate the efficiency of this process. However, the net profit margin is not merely the amount of cash left in the company after all of the costs (e.g., salaries, utilities, or depreciation) are covered. That's the gross profit margin. In order to get your hands on the net profit, you have to take into account all of the operating expenses, interest expenses, and taxes. The result of these calculations is displayed in percents, but you may also express them in decimal form (e.g., 13% becomes 0.13). Note that the net profit margin ratio is not the same as profit margin of the business you're trying to analyze. Get data on the net profit. Remember that net profit = total revenues - total expenses, with total expenses including operating expenses, interest expenses, and taxes. Take a look at the net profit margin formula above. The result of this equation is not an absolute number, but rather a percentage of total revenue. You're good to go. Employ net profit margin formula by dividing net profit by total revenue, or - since you're here - do it using our net profit margin calculator. Now scroll down to see how to interpret your calculations, and learn if there are proper or advisable values of the net profit margin ratio. Once you employ the net profit margin formula, it's quite easy to compare its values over time and see what's a company's performance against the market or its main competitors. Unless the profit of a company is negative (i.e., it generates a loss), the net profit margin formula should produce a value from 0% to 100%. In practice, it's often hard to find estimates larger than 30%. You may be tempted to think that the higher your net profit margin, the better for you. Most of the time, you will be right. Keep in mind, however, that typical values of this indicator depend on the type of business your in, as well as the overall shape of the economy. If your company faces fierce competition, your net profit margin will probably be lower compared to a situation when you're a sole supplier to the market. Consequently, the desirable values of this indicator are entirely relative. It's also a good idea to compare profitability measures to liquidity indicators, such as the current ratio, to get a broader picture of a company's financial stance. Also, net income margin of different enterprises varies significantly across industries. For example, information services in the U.S. reveal on average a fairly high net profit margin ratio of about 13.4%. At the same time, the shipbuilding industry is characterized by a negative value of this indicator, -1.8%. You can check out this great database on margins by sectors prepared by Aswath Damodaran of the Stern School of Business at New York University to see what's an average net profit margin ratio in various sectors of the U.S. economy. Net Profit Margin Calculator can be embedded on your website to enrich the content you wrote and make it easier for your visitors to understand your message.